The modern world makes human beings always busy. Most of the day, we sit at a desk for work, networking, communication and even for relaxation. Since sitting too long isn’t a good thing, we are facing a lot of problems relating to our health, such as increasing the risk of cancer, obesity, diabetes and heart disease. Perceiving this issue, Exerpeutic designed an innovative exercise bike – Exerpeutic WorkFit 1000. 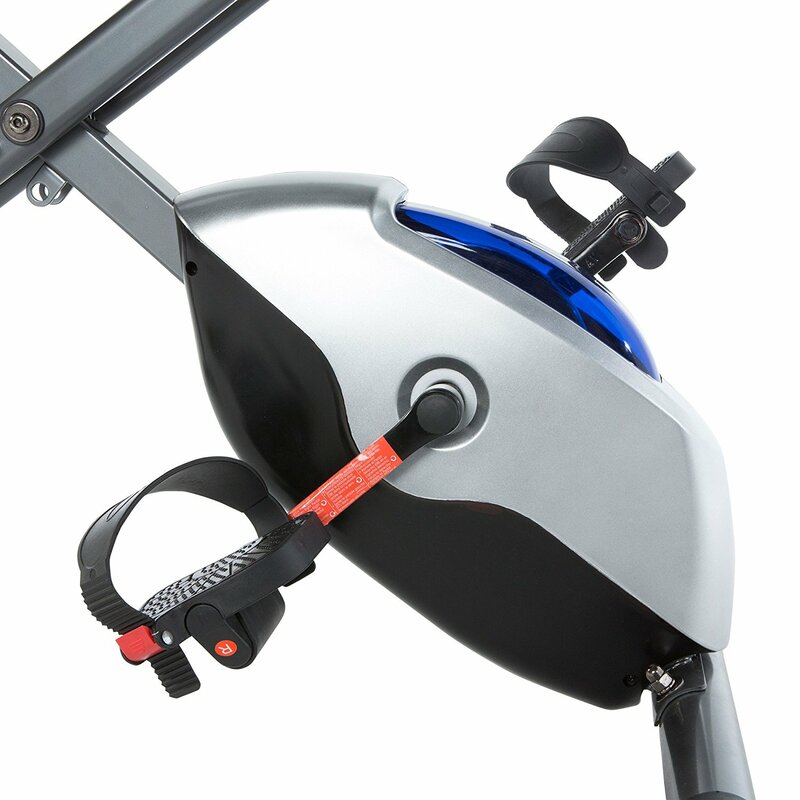 This bike is designed to give you an ability to workout while working. Let’s have a look at this bike to see its advantages and disadvantages, as well as whether it suits you or not. 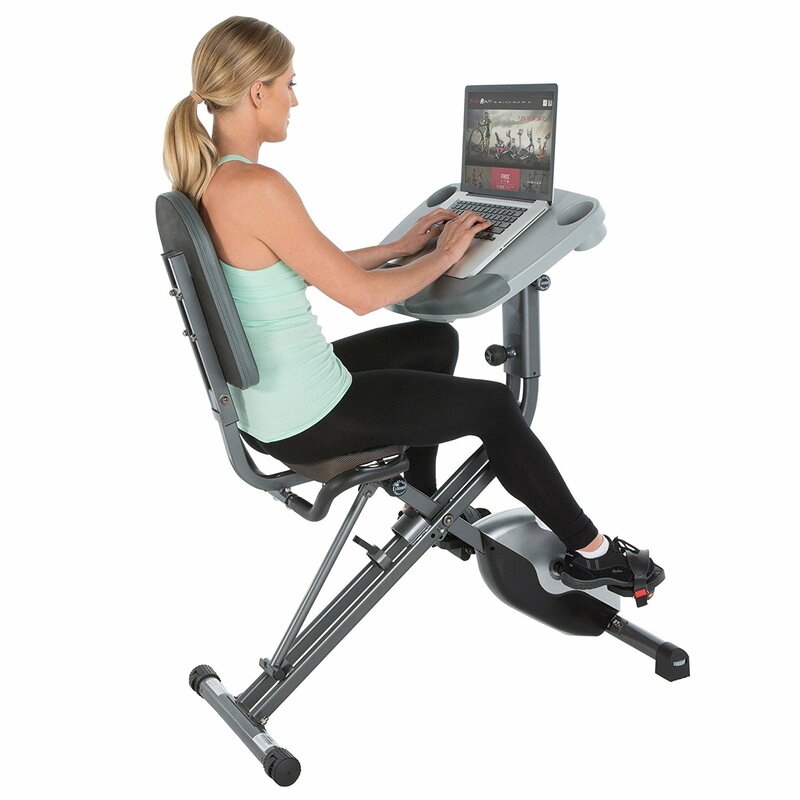 Exerpeutic WorkFit 1000 is a desk folding exercise bike, which can be categorized as a recumbent bike. As a recumbent bike, the bike focuses on the comfort and the easiness. It is the bike for blood flow, cardiovascular and lower body workout, and is the best choice for those want to maintain a healthy lifestyle or being in a physical rehabilitation and physical therapy. Its design makes it easy on your back and knees, especially suitable to those have problems with joints or being injured, kids, women and oldsters. 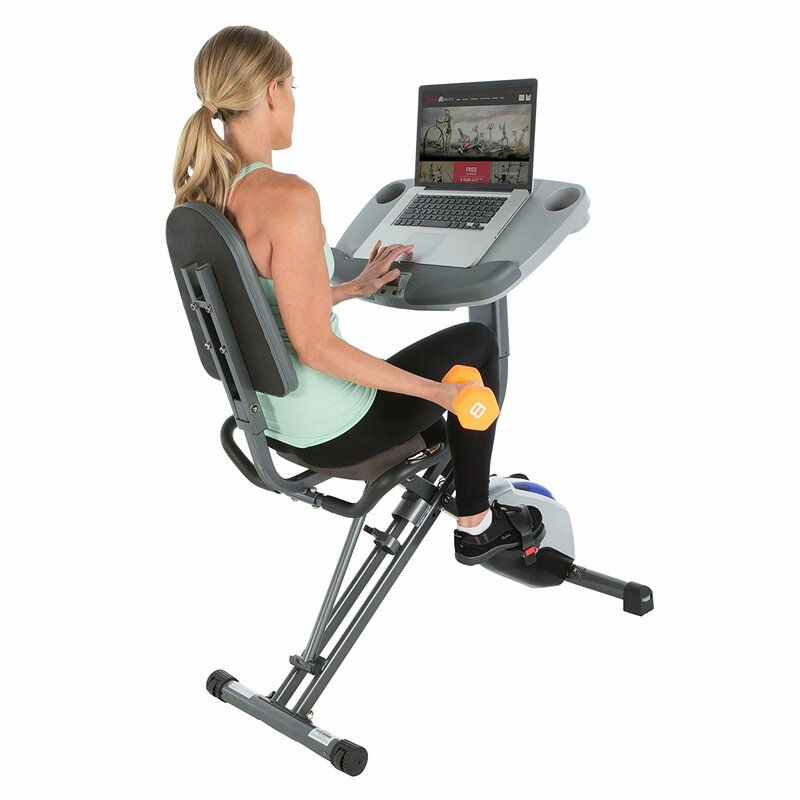 The thing makes Exerpeutic WorkFit 1000 different from a traditional recumbent exercise bike is that it is designed more upright with an adjustable desktop. This design will make you more convenient but less comfortable than a traditional recumbent bike. 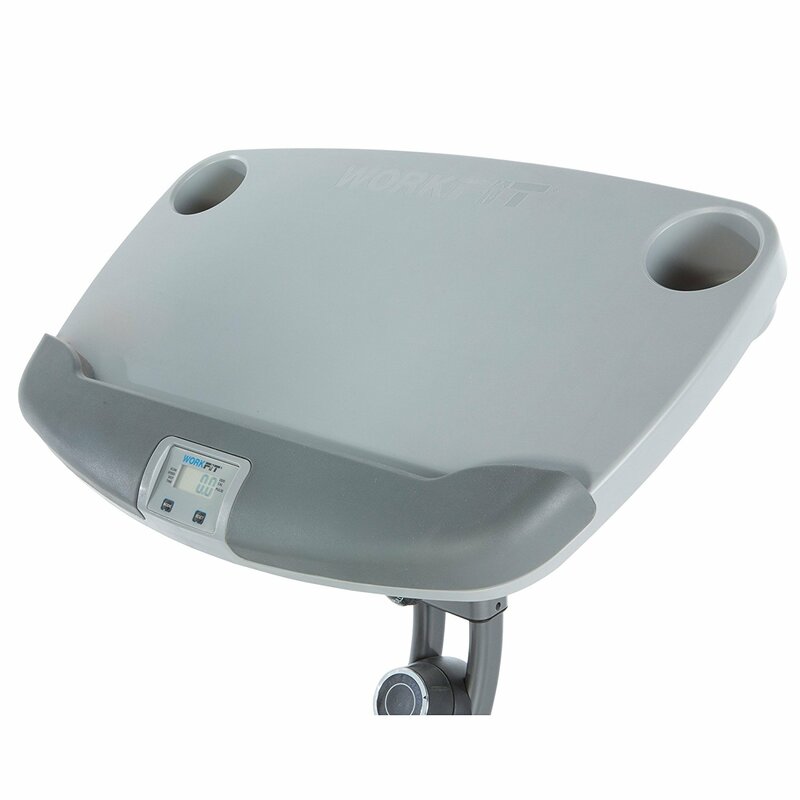 First thing recognized when looking at Exerpeutic WorkFit 1000 is that it has a really compact design. Its dimensions are 45.3″ L x 25″ W x 51.3″ H, which means you need only 1132.5 square inches for placing the bike. Exerpeutic 1000 fits any kind of department you living. The weight of Exerpeutic 1000 is light too, just 64.7 lbs. Along with its assembly and folding capability, you can move this bike easily and can store it when not in use. Despite the lightweight and compact design, Exerpeutic 1000 can support up to 5′ 2″ to 6′ 3″ height and 300 lbs weight. Exerpeutic 1000 is equipped with durable powder coated steel frame construction, padded seat, 3 piece crank system, offering stable, smooth and consistent pedalling feeling, and a quiet operation. This recumbent bike does not come fully assembled. The only pre-installed components include the drive and frame. However, it is quite easy to unbox and assembled it, you might need about 1 hour or more. The padded chair bottom and backrest might cause some problems for the air circulation, which can make you feel uncomfortable after long hours. The design of Exerpeutic WorkFit 1000 doesn’t suit to intense workouts. Exerpeutic WorkFit 1000 has a steel frame and stabilizer bars, secure enough for steady pedalling experience. The bike will hold you steady without concerns of tipping over, thus, the workout will not disturb your work. Furthermore, it is very easy to get on and off the bike, providing a more effective and comfortable workout. The bike is flexible, you can adjust the desk position vertically, horizontally and the angle to fit you best. The frame can be folded for more convenience, and additional transportation wheels provided for easy relocation. You can place firmly this bike on a floor that has some variation in it by adjusting the front stabilizer bar caps. Thanks to magnetic resistance mechanism, Exerpeutic WorkFit 1000 has 8 levels of resistance that can easily adjust using this knob. All the bike frame is powder coated in dark grey, making the bike look nice. Exerpeutic WorkFit 1000’s seat called AirSoft is oversized – 11″ L X 15″ W, using aerodynamic healthcare technology allowing air to breathe through the fabric. This will make more air circulation, reduce the uncomfortable feeling after many hours of use. This seat is adjustable to fit 5 ft 2″ to 6 ft 3″ user height. 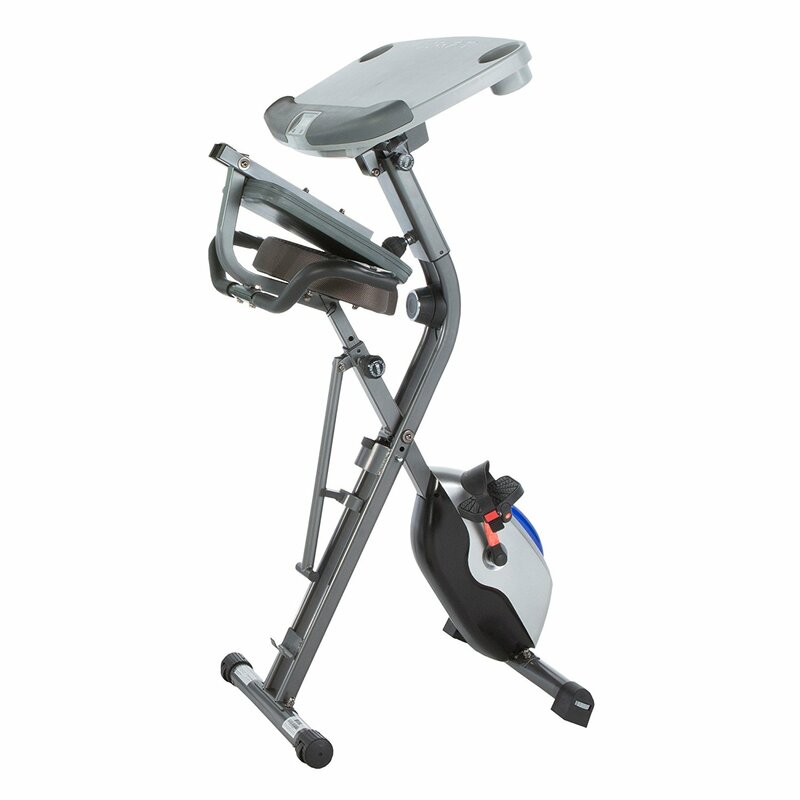 This exercise bike has a large cushioned backrest – 15.5″ H X 11.3″ W, giving you the back support. However, it is not adjustable back and forth, which makes some inconveniences, I will mention details in section 4. Although the seat bottom is designed for additional air circulation, however, it cannot be as airy as a vented seat. So in a long workout section, it will still be hot and humid. The handlebars under the seat give your hand something to hold, securing your body, and lowering the pressure on your shoulder and back when you are riding. However, there are two cons: The angle and position of them cannot be adjusted, and they are quite too low for maximum comfort. Two large pedals with adjustable foot straps are in front of you, giving you proper alignment for efficient pedalling with ultimate control. 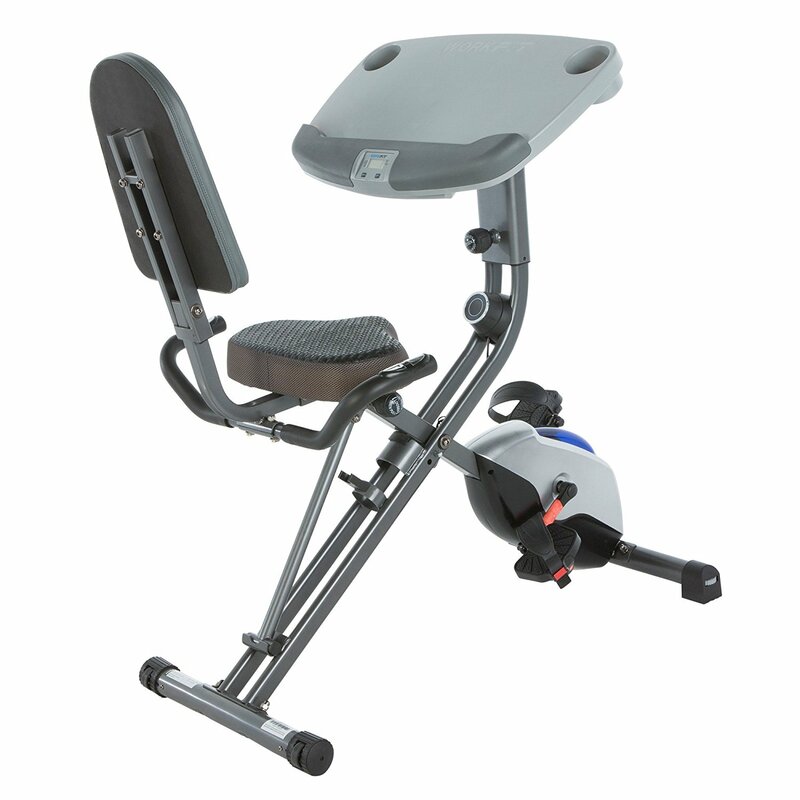 Exerpeutic WorkFit 1000 has 3 piece crank system. 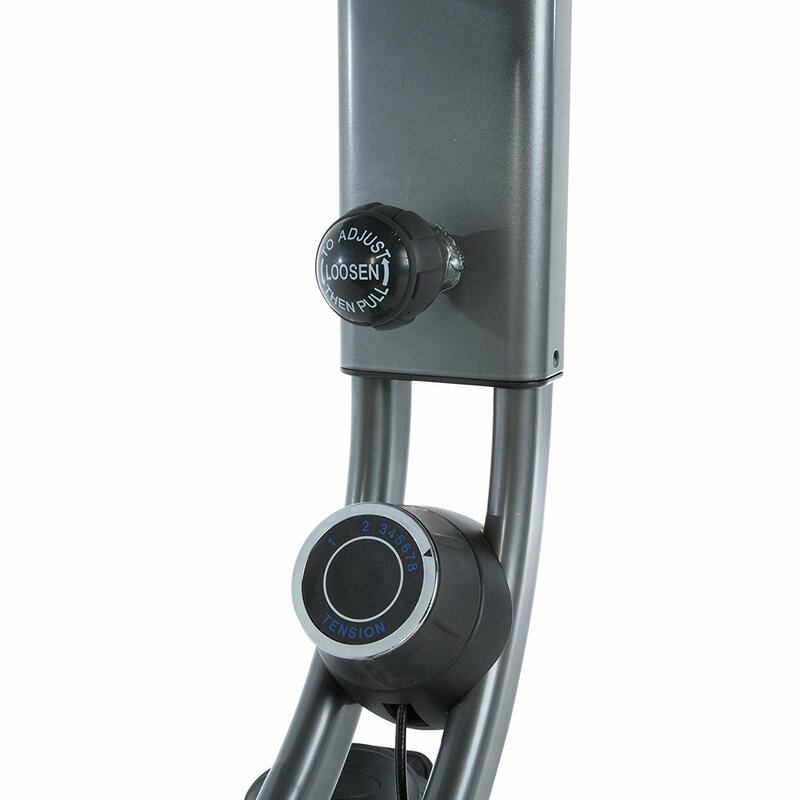 This high-torque design provides users with a flexible, smooth and consistent pedalling motion. However, the material of these straps is plastic, which might make your foot hurt. 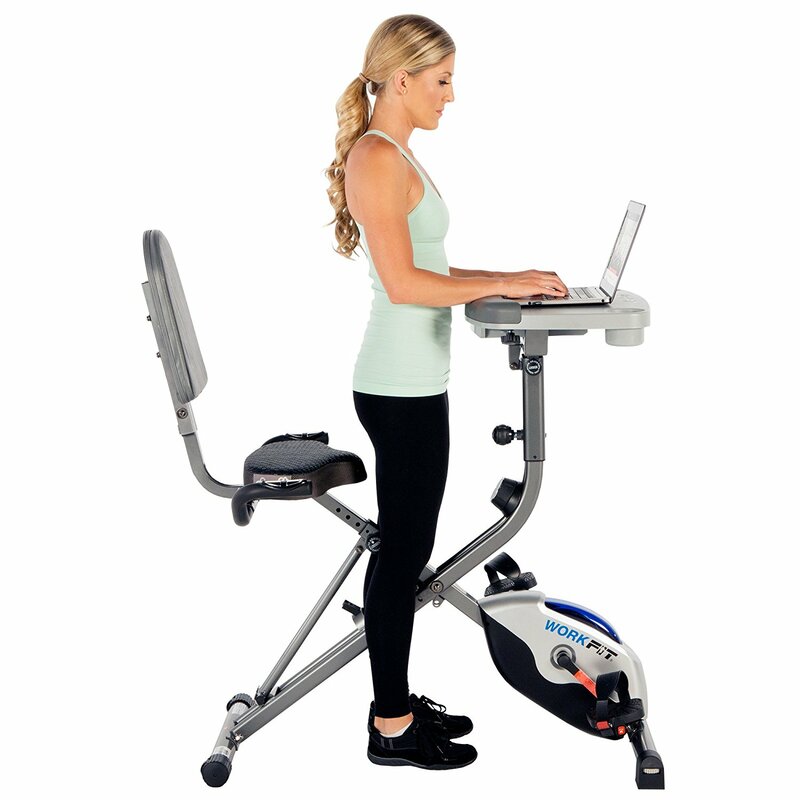 The most special feature of this exercise bike in comparison with others is the convenient desktop. It can be used for laying books, tablets, laptops, smartphone or anything you wish. You can continue doing anything while exercising. The desktop’s dimensions are 24″ x 16″, and support up to 44 lbs. It has over 9 different desk positions, including 3 angles positions – 0, 16 and 33, adjustable height positions between 41 ins and 45 ins from the floor, and capacity to slide the desktop back and forth. 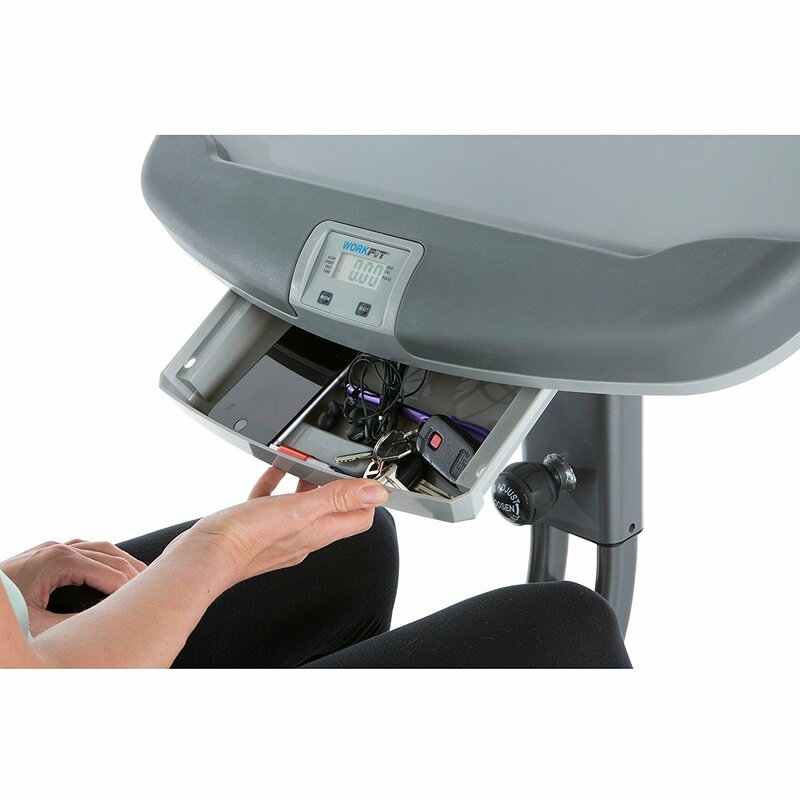 There is a storage drawer under the desktop and two bottle holders to keep everything you need when exercising. The console with an LCD screen using 2 AAA batteries lets you monitor distance, calories burned, time, speed, odometer, scan and heart rate while practising. There is no workout program profile nor you can set the goal of the workout. Convenience is the most excellent experience that Exerpeutic WorkFit 1000 can give you. The workout will be smooth, quiet, comfortable and effortless that will not interrupt your studying/working/entertaining. Because of the position of pedals, your back will be not so well-supported if your legs are short. In fact, your back can’t reach the backrest while pedalling. The console doesn’t provide any interesting preset workout program. Only suitable for light to moderate workouts. As any recumbent exercise bike, this exercise bike forms you in a good posture that can support your back, shoulders, knees and ankles. When sitting, your back will be slightly backward, leaning your back on the seat back, holding the handlebar to lift your body up. As the pedals are in front of you, you will straighten your legs, together with the lifted upper body, making a proper posture when exercising. However, the design is not ergonomic, so if you are used to seating on an ergonomically designed exercise bike, you will feel uncomfortable. The chair is specially padded, providing you with a supported and airy feeling. And so does the backrest. However, in a long workout section, you still feel hot and wet. 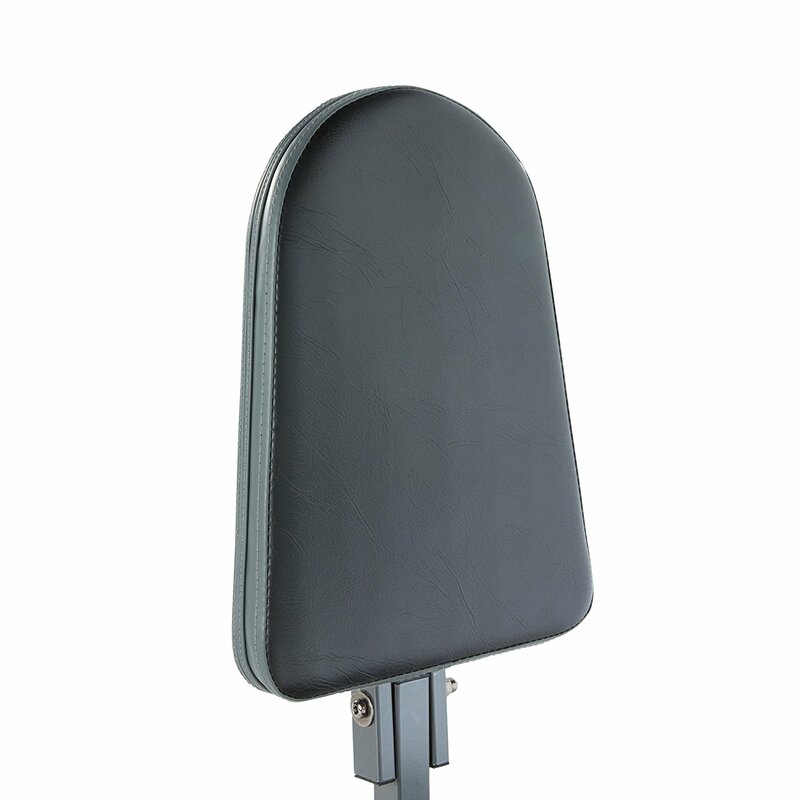 The backrest is not adjustable and a little too high for those have a short body form, they may feel uncomfortable since they don’t have enough back support. To solve this problem, you can put a pillow put on the seat, your lower back will be supported more. However, this will make the heat problem even worse, and the advantage of aerodynamic healthcare technology will be in vain. 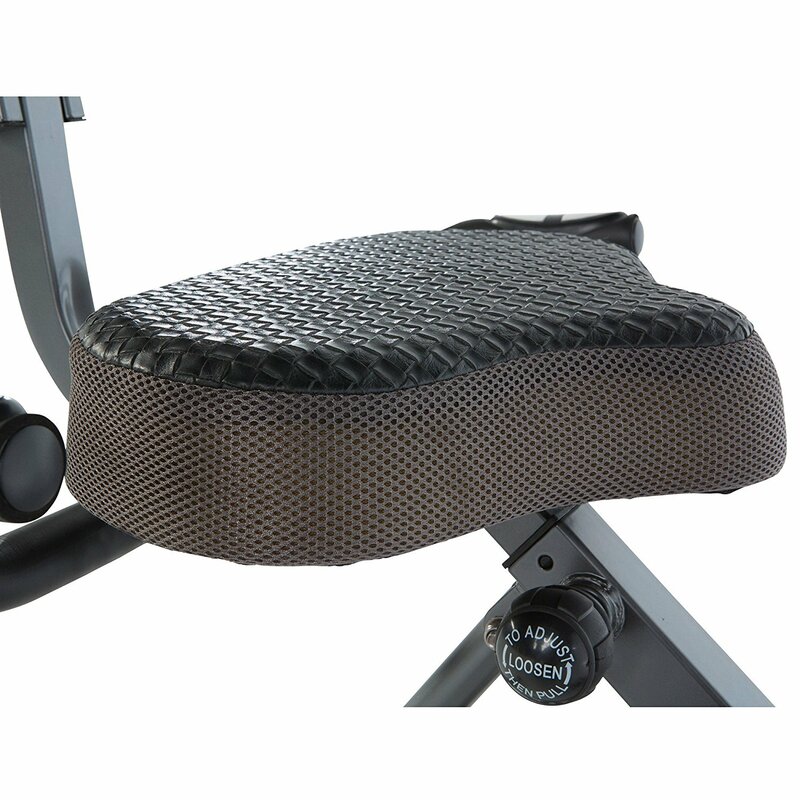 One more thing relating to the seating position that you need to be fully aware of before purchasing Exerpeutic WorkFit 1000 is that the position of pedals are down at an angle, making those whose legs are short can lay their back on the backrest. At the heart of Exerpeutic WorkFit 1000 is a heavy flywheel creating resistance and momentum, thus, when you start pedalling, your first several rotations are extremely hard. However, the more you practice the more smooth and easier the rotations become, even, you need to generate a force to slow down the speed. This resistance and momentum make it interesting and effective when practising, that make you don’t want to stop once started. To create the resistance, Exerpeutic WorkFit 1000 has a belt resistance mechanism. This kind of mechanism is not so advanced, but good enough to operate smooth and quiet. You can turn the knob to increase or decrease the tension since the bike has 8 level tension resistance. One more important thing is that the solid frame provides firm feeling during your workout. However, the seat appears to have trouble staying firmly in place when you are in intense workouts. But since it’s a recumbent bike, it is made for the light and medium workouts, this maybe not a big disadvantage. Exerpeutic WorkFit 1000 is perfect for cardio workouts, and physical rehabilitation/physical therapy treatments, as well as maintaining a healthy lifestyle. Its smooth operation and joint supports make it’s suitable for those have joint problems or being injured. In addition, thanks to the desktop, you can enjoy music via your tablet while exercising. Music can not only boost your mood, push your performance, help you keep pace but also can be used for recovery. The beat is like a signal to your brain that keeps you maintaining a rhythm. You might pedal for hours without notice that. Or you can set goals for yourself, using this advantage, such as workout until the movie end, or workout while trying to finish work tasks. Exerpeutic WorkFit 1000 costs about $200. A really affordable price for such a good exercise bike like this. 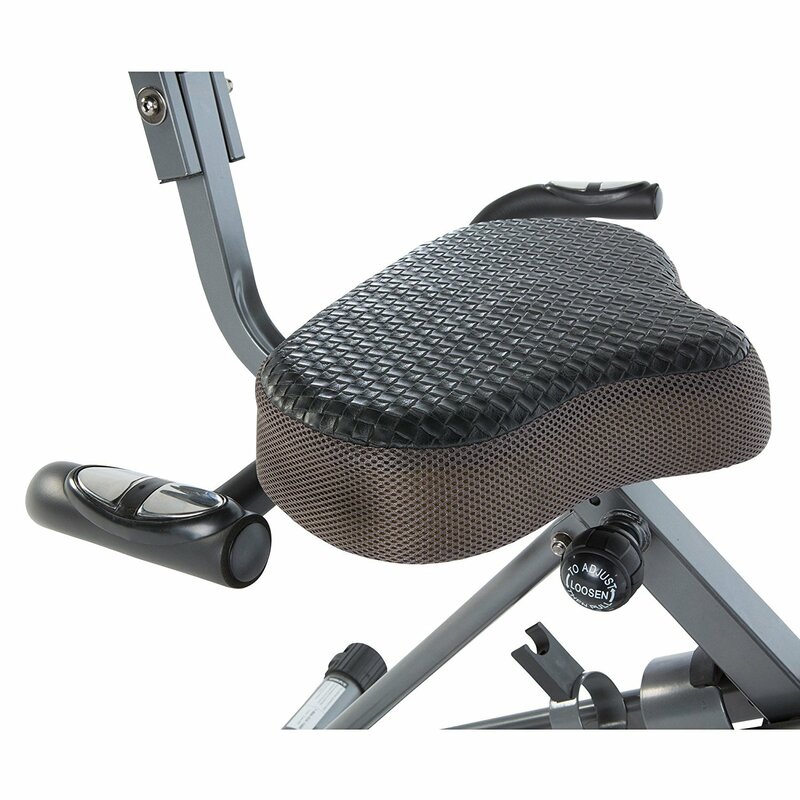 Exerpeutic WorkFit 1000 comes with a good warranty program: 5 years for manufacturer defects and 90 days for all parts and workmanship, including upholstery, foam, ball bearings, pulleys, cables, shocks, all tension mechanisms, wheels, pedals and hardware. The warranty does not include any damage caused by improper operation, misuse or commercial application, and does not offer to the transferred owners. In warranty protected time, any defects will be fixed or replaced free, however, the proof of purchase will be required. So, basically, this product is high-rated by hundreds of users. In the comment section, there are many positive reviews. People liked its sturdy, easy moving ability, and of course its desktop. They needed slightly more than an hour to assemble it. It seems that Exerpeutic WorkFit 1000 is prefered a lot by freelancers and writers since they can sit on this bike all day at home for working and exercising. Many others enjoyed playing games/watching Netflix on this bike since Exerpeutic WorkFit 1000 has a quiet operation. Also, there are some negative reviews, mostly because of the quality control process – these problems are easy to fix as that they offer replacements for defective products. But, one disadvantage you must be concerned is that an around 5’3″ girl said that she was not able to lean her back on the backrest while pedalling, and the desktop is a little too high that her arms were elevated. Others complain that they had to replace some parts like the belt and the bearings after a year of use. However, for me, this is still a good exercise bike at $200. If you want to purchase a more expensive bike that comes along with a high quality – I will recommend some below. In conclusion, Exerpeutic WorkFit 1000 is a convenient bike that gives you the ability to workout while working or entertaining. It has an affordable price, but inspiring enough to motivate you to maintain a healthy lifestyle. By committing to exercise using this bike, surely you can improve your cardiovascular health and stay fit. It is also good for physical rehabilitation/physical therapy treatment. Exerpeutic WorkFit 1000 is a great choice for freelancers. However, the features of Exerpeutic WorkFit 1000 are really basic and there are some disadvantages mentioned above, if you want a more advanced bike, you can check my recommendations below.